36mm Everose Rolesor case with Oystersteel monobloc middle case, screw-down steel back, screw-down 18K Everose crown, 18K Everose fluted bezel, black dial, 10 diamond hour markers, Rolex calibre 3235 self-winding movement with date at 3 o'clock, approximately 70 hours of power reserve, Everose Rolesor Oyster bracelet with flat three-piece links, folding Oysterclasp buckle with Easylink 5mm comfort extension link. Waterproof to 100 meters. Redesigned for Baselworld 2018 with updated case sides, lugs, and calibre 3235 movement. 36mm Everose Rolesor case with Oystersteel monobloc middle case, screw-down steel back, screw-down 18K Everose crown, 18K Everose fluted bezel, chocolate Jubilee dial, 10 diamond hour markers, Rolex calibre 3235 self-winding movement with date at 3 o'clock, approximately 70 hours of power reserve, Everose Rolesor Oyster bracelet with flat three-piece links, folding Oysterclasp buckle with Easylink 5mm comfort extension link. Waterproof to 100 meters. Redesigned for Baselworld 2018 with updated case sides, lugs, and calibre 3235 movement. 36mm Everose Rolesor case with Oystersteel monobloc middle case, screw-down steel back, screw-down 18K Everose crown, 18K Everose fluted bezel, dark rhodium dial, Roman numerals with diamond set 6 and 9, Rolex calibre 3235 self-winding movement with date at 3 o'clock, approximately 70 hours of power reserve, Everose Rolesor Oyster bracelet with flat three-piece links, folding Oysterclasp buckle with Easylink 5mm comfort extension link. Waterproof to 100 meters. Redesigned for Baselworld 2018 with updated case sides, lugs, and calibre 3235 movement. 36mm Everose Rolesor case with Oystersteel monobloc middle case, screw-down steel back, screw-down 18K Everose crown, 18K Everose fluted bezel, dark rhodium dial, index hour markers with Chromalight, Rolex calibre 3235 self-winding movement with date at 3 o'clock, approximately 70 hours of power reserve, Everose Rolesor Oyster bracelet with flat three-piece links, folding Oysterclasp buckle with Easylink 5mm comfort extension link. Waterproof to 100 meters. Redesigned for Baselworld 2018 with updated case sides, lugs, and calibre 3235 movement. 36mm Everose Rolesor case with Oystersteel monobloc middle case, screw-down steel back, screw-down 18K Everose crown, 18K Everose fluted bezel, white mother-of-pearl dial, 10 diamond hour markers, Rolex calibre 3235 self-winding movement with date at 3 o'clock, approximately 70 hours of power reserve, Everose Rolesor Oyster bracelet with flat three-piece links, folding Oysterclasp buckle with Easylink 5mm comfort extension link. Waterproof to 100 meters. Redesigned for Baselworld 2018 with updated case sides, lugs, and calibre 3235 movement. 36mm Everose Rolesor case with Oystersteel monobloc middle case, screw-down steel back, screw-down 18K Everose crown, 18K Everose fluted bezel, rose dial, Roman numerals with diamond set 6 and 9, Rolex calibre 3235 self-winding movement with date at 3 o'clock, approximately 70 hours of power reserve, Everose Rolesor Oyster bracelet with flat three-piece links, folding Oysterclasp buckle with Easylink 5mm comfort extension link. Waterproof to 100 meters. Redesigned for Baselworld 2018 with updated case sides, lugs, and calibre 3235 movement. 36mm Everose Rolesor case with Oystersteel monobloc middle case, screw-down steel back, screw-down 18K Everose crown, 18K Everose fluted bezel, white dial, index hour markers with Chromalight, Rolex calibre 3235 self-winding movement with date at 3 o'clock, approximately 70 hours of power reserve, Everose Rolesor Oyster bracelet with flat three-piece links, folding Oysterclasp buckle with Easylink 5mm comfort extension link. Waterproof to 100 meters. Redesigned for Baselworld 2018 with updated case sides, lugs, and calibre 3235 movement. 36mm Everose Rolesor case with Oystersteel monobloc middle case, screw-down steel back, screw-down 18K Everose crown, 18K Everose fluted bezel, white dial, Roman numerals, Rolex calibre 3235 self-winding movement with date at 3 o'clock, approximately 70 hours of power reserve, Everose Rolesor Oyster bracelet with flat three-piece links, folding Oysterclasp buckle with Easylink 5mm comfort extension link. Waterproof to 100 meters. Redesigned for Baselworld 2018 with updated case sides, lugs, and calibre 3235 movement. 36mm stainless steel case, 18K Everose gold screw-down crown, 18K Everose gold fluted bezel, scratch-resistant sapphire crystal with cyclops lens over the date, black concentric circle dial, Arabic numerals, Rolex calibre 3135 automatic movement, stainless steel and 18K Everose gold Oyster bracelet with three-piece links, folding Oysterclasp buckle with Easylink 5mm comfort extension link. Waterproof to 100 meters. 36mm stainless steel case, 18K Everose gold screw-down crown, 18K Everose gold fluted bezel, scratch-resistant sapphire crystal with cyclops lens over the date, black dial, diamond hour markers, Rolex calibre 3135 automatic movement, stainless steel and 18K Everose gold Oyster bracelet with three-piece links, folding Oysterclasp buckle with Easylink 5mm comfort extension link. Waterproof to 100 meters. 36mm stainless steel case, 18K Everose gold screw-down crown, 18K Everose gold fluted bezel, scratch-resistant sapphire crystal with cyclops lens over the date, black Jubilee dial, diamond hour markers, Rolex calibre 3135 automatic movement, stainless steel and 18K Everose gold Oyster bracelet with three-piece links, folding Oysterclasp buckle with Easylink 5mm comfort extension link. Waterproof to 100 meters. 36mm stainless steel case, 18K Everose gold screw-down crown, 18K Everose gold fluted bezel, scratch-resistant sapphire crystal with cyclops lens over the date, black dial, Roman numerals, Rolex calibre 3135 automatic movement, stainless steel and 18K Everose gold Oyster bracelet with three-piece links, folding Oysterclasp buckle with Easylink 5mm comfort extension link. Waterproof to 100 meters. 36mm stainless steel case, 18K Everose gold screw-down crown, 18K Everose gold fluted bezel, scratch-resistant sapphire crystal with cyclops lens over the date, black dial, index hour markers, Rolex calibre 3135 automatic movement, stainless steel and 18K Everose gold Oyster bracelet with three-piece links, folding Oysterclasp buckle with Easylink 5mm comfort extension link. Waterproof to 100 meters. 36mm stainless steel case, 18K Everose gold screw-down crown, 18K Everose gold fluted bezel, scratch-resistant sapphire crystal with cyclops lens over the date, chocolate floral dial, diamond Arabic 6 and 9 numerals, Rolex calibre 3135 automatic movement, stainless steel and 18K Everose gold Oyster bracelet with three-piece links, folding Oysterclasp buckle with Easylink 5mm comfort extension link. Waterproof to 100 meters. 36mm stainless steel case, 18K Everose gold screw-down crown, 18K Everose gold fluted bezel, scratch-resistant sapphire crystal with cyclops lens over the date, pink champagne dial, diamond hour markers, Rolex calibre 3135 automatic movement, stainless steel and 18K Everose gold Oyster bracelet with three-piece links, folding Oysterclasp buckle with Easylink 5mm comfort extension link. Waterproof to 100 meters. 36mm stainless steel case, 18K Everose gold screw-down crown, 18K Everose gold fluted bezel, scratch-resistant sapphire crystal with cyclops lens over the date, champagne dial, Roman numerals, Rolex calibre 3135 automatic movement, stainless steel and 18K Everose gold Oyster bracelet with three-piece links, folding Oysterclasp buckle with Easylink 5mm comfort extension link. Waterproof to 100 meters. 36mm stainless steel case, 18K Everose gold screw-down crown, 18K Everose gold fluted bezel, scratch-resistant sapphire crystal with cyclops lens over the date, pink champagne dial, index hour markers, Rolex calibre 3135 automatic movement, stainless steel and 18K Everose gold Oyster bracelet with three-piece links, folding Oysterclasp buckle with Easylink 5mm comfort extension link. Waterproof to 100 meters. 36mm stainless steel case, 18K Everose gold screw-down crown, 18K Everose gold fluted bezel, scratch-resistant sapphire crystal with cyclops lens over the date, dark mother of pearl dial, diamond hour markers, Rolex calibre 3135 automatic movement, stainless steel and 18K Everose gold Oyster bracelet with three-piece links, folding Oysterclasp buckle with Easylink 5mm comfort extension link. Waterproof to 100 meters. 36mm stainless steel case, 18K Everose gold screw-down crown, 18K Everose gold fluted bezel, scratch-resistant sapphire crystal with cyclops lens over the date, silver dial, 10 diamond hour markers, Rolex calibre 3135 automatic movement, stainless steel and 18K Everose gold Oyster bracelet with three-piece links, folding Oysterclasp buckle with Easylink 5mm comfort extension link. Waterproof to 100 meters. 36mm stainless steel case, 18K Everose gold screw-down crown, 18K Everose gold fluted bezel, scratch-resistant sapphire crystal with cyclops lens over the date, silver Jubilee dial, diamond hour markers, Rolex calibre 3135 automatic movement, stainless steel and 18K Everose gold Oyster bracelet with three-piece links, folding Oysterclasp buckle with Easylink 5mm comfort extension link. Waterproof to 100 meters. 36mm stainless steel case, 18K Everose gold screw-down crown, 18K Everose gold fluted bezel, scratch-resistant sapphire crystal with cyclops lens over the date, silver dial, index hour markers, Rolex calibre 3135 automatic movement, stainless steel and 18K Everose gold Oyster bracelet with three-piece links, folding Oysterclasp buckle with Easylink 5mm comfort extension link. Waterproof to 100 meters. 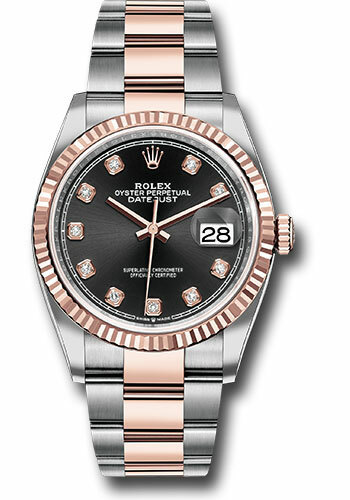 36mm stainless steel case, 18K Everose gold screw-down crown, 18K Everose gold fluted bezel, scratch-resistant sapphire crystal with cyclops lens over the date, steel dial, 10 diamond hour markers, Rolex calibre 3135 automatic movement, stainless steel and 18K Everose gold Oyster bracelet with three-piece links, folding Oysterclasp buckle with Easylink 5mm comfort extension link. Waterproof to 100 meters. 36mm stainless steel case, 18K Everose gold screw-down crown, 18K Everose gold fluted bezel, scratch-resistant sapphire crystal with cyclops lens over the date, steel dial, Roman numerals, Rolex calibre 3135 automatic movement, stainless steel and 18K Everose gold Oyster bracelet with three-piece links, folding Oysterclasp buckle with Easylink 5mm comfort extension link. Waterproof to 100 meters. 36mm stainless steel case, 18K Everose gold screw-down crown, 18K Everose gold fluted bezel, scratch-resistant sapphire crystal with cyclops lens over the date, white dial, diamond hour markers, Rolex calibre 3135 automatic movement, stainless steel and 18K Everose gold Oyster bracelet with three-piece links, folding Oysterclasp buckle with Easylink 5mm comfort extension link. Waterproof to 100 meters. 36mm stainless steel case, 18K Everose gold screw-down crown, 18K Everose gold fluted bezel, scratch-resistant sapphire crystal with cyclops lens over the date, white dial, Roman numerals, Rolex calibre 3135 automatic movement, stainless steel and 18K Everose gold Oyster bracelet with three-piece links, folding Oysterclasp buckle with Easylink 5mm comfort extension link. Waterproof to 100 meters.